Analysing the increasingly prominent role of solar power across the island amidst Ireland’s diversifying energy mix. Drawn from a range of sectors and government departments, Ireland’s National Mitigation Plan outlined a pathway towards decarbonisation for the first time. The document, published in 2017, highlighted a sharp decline in costs of solar photovoltaic (PV) globally, with increased levels of solar (rooftop and mounted) and microgeneration technologies offering further contributions to Ireland’s renewable energy portfolio. The National Mitigation Plan also confirmed that the prices of such technology will see a continued global decline. Regardless of such a decline, it is generally accepted that the use of solar technology in Ireland is less efficient than, for example, in southern Europe, where solar penetration is stronger. Indeed, offshore wind has traditionally been the most cost-competitive renewable electricity technology in Ireland, accounting for 22.8 per cent of overall electricity generation in 2015. Despite this, it is recognised that other energy sources, such as solar, can play an important role in Ireland’s future energy mix. The deployment of solar technology in Ireland is intended to diversify the country’s renewable generation portfolio over a 10-year period between 2020 and 2030, with a particular focus on cost efficiency and effectiveness. The convenience of solar PV, which can be deployed in roof-mounted or ground-mounted installations, has been highlighted as a means of empowering the Irish citizen to take control and ownership over energy production and consumption. The benefits of solar PV to Ireland’s energy mix have been recognised by the Department of Communications, Climate Action and Environment (DCCAE), who considered the technology as part of the Renewable Electricity Support Scheme (RESS) which was published in July 2018. The new scheme will provide support to renewable energy projects in Ireland, whilst increasing energy security and sustainability. The Government’s objective of diversifying Ireland’s energy mix may play to the advantage of the solar sector at first auction, as it seeks to ramp up investment in nascent technologies. Financial support is currently available for solar thermal heating technology through grants offered by the Sustainable Energy Authority of Ireland (SEAI). Small and Medium Enterprises (SMEs) and large industry can both benefit from these grants. Similarly, households can also avail of grant support for solar thermal under the Better Energy Homes Scheme. Domestic solar thermal systems are designed to meet 50-60 per cent of a household’s hot water requirement across the year. The SEAI have approved 375,000 applications for the Better Energy Homes Scheme since its inception. Support has also been offered by the SEAI in the form of a Residential Rooftop Solar PV Scheme, which was announced in August 2018. The scheme provides a contribution of up to €3,800 towards total installation costs, and has been highlighted as a measure which would bring more jobs to Ireland’s growing solar sector. The SEAI have argued that such a strategy will encourage self-consumption towards 100 per cent, whilst enhancing public understanding and uptake of solar. Similarly, the Warmer Home Energy scheme offers a broad range of measures free to householders in need of energy efficiency upgrades, totalling to an average of €3,000. Some of the measures included in the scheme are attic and cavity wall insulation; draught proofing; lagging jackets and low energy light bulbs. ESB Networks recorded over 500 applications for the installation of solar projects in the Republic of Ireland, according to a completed application list published in 2018. These installations would offer a combined total of over 4,000MW. It is estimated that 1,500MW is achievable by 2022, representing 5 per cent of Ireland’s electricity demand. The ISEA estimates that 2GW solar power could create over 7,000 jobs whilst meeting 7 per cent of the country’s electricity demand. Aside from this economic contribution, such solar growth could greatly assist Ireland in meeting its EU target of generating 16 per cent of energy requirement from renewables by 2020. Current plans outline that this will be met by 40 per cent from renewable electricity, 12 per cent from renewable heat and 10 per cent from the renewable transport sector. Regardless of such measures, it is widely predicted that Ireland will fail in its 2020 objectives, with current projections lagging far behind at only 13.2 per cent. Also increasingly the viability of green energy products in Ireland is the lifting of an EU ban on Chinese solar imports. David Maguire of the ISEA has argued that the move could bring down the cost of new Irish solar projects by 10 per cent, whilst encouraging greater supply and competition. The ending of solar import controls from China comes following a 2013 ban, after it was accused of selling solar technology at artificially low prices to shut down European competition. Planning permission for solar farms has been sought in over 220 applications to local authorities since June 2015. Typical applications submitted to local authorities are from solar farms ranging in size from 20 to 30 acres and offer an average of 5MW of electrical energy. The majority of such applications were submitted with the expectation of a Government support mechanism which would make building more commercially viable. However, such a system has yet to be introduced. Of particular importance to those considering new solar projects is the proximity of their proposed site to the local substation. Current Irish requirements necessitate a direct connection to the local grid network, unlike many examples across the United Kingdom and Germany where access is provided by a direct connection via an overhead line across sites. 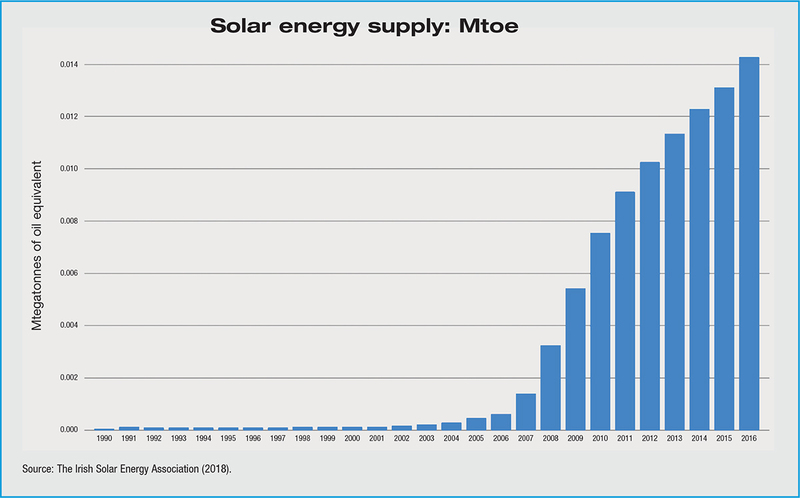 Many factors can party explain the rapid deployment of solar PV across the world in recent years. These include the convenience of the panels, combined with an international push to embrace renewable energy sources. However, two major factors which explain the rise of solar include a drastic drop in module price from $70/watt in 1970 to $0.278/watt as of June 2018, as well as generous government subsidies. Advocates of this increasingly prominent renewable energy source argue that it will have a minimal impact upon the environment, whilst delivering significant benefits to the consumer and the Irish economy as a whole. It is therefore clear that with the correct support, promotion and subsidisation, solar holds the potential to become one of the most economically viable renewable energy sources on the island of Ireland. This concept is supported by the Irish Solar Energy Association (ISEA), who argue that solar, as an energy source, has been traditionally overlooked, with greater focus placed on other sources such as wind. Despite this fact, solar is now internationally recognised as an integral component of the renewable energy mix and may create a pathway through which Ireland could accelerate the rollout of renewable energy at an affordable cost, whilst also creating much needed employment opportunities in the country’s energy sector. The benefits of solar energy extend far beyond the provision of clean, ‘green’ energy and electricity, according to ISEA. The organisation argues that the introduction of solar PV should be viewed within the broader context of Ireland’s energy mix, where the energy source can complement other renewable technologies such as tidal and wind. Indeed, advocates of solar PV agree that it significantly contributes to the creation of a diverse and secure supply of electricity, whilst generating income for farmers and supporting economic and social growth. The substantial decline in the costs of solar PV technology have not only benefitted the consumer. Decreasing prices combined with increased interest have encouraged further innovation in the solar sector. 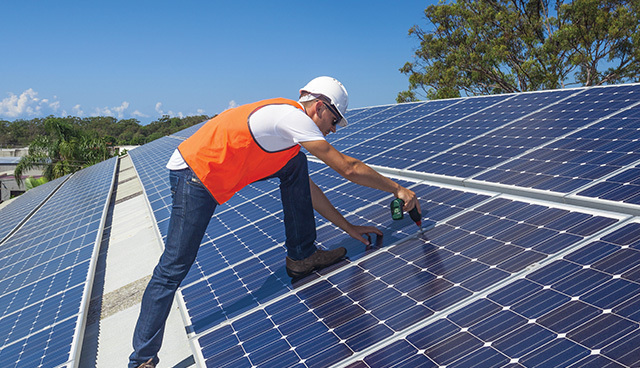 Evidence suggests that applications for solar projects are rapidly expanding and range from solar panels in electric vehicles to solar walls in buildings. Beyond the benefits of innovation, the expansion of solar PV is also predicted to add further value to the economic, environmental and social policy objectives of the Irish Government. The ISEA estimates that an annual subsidy of €30 million will be required to make the solar sector competitive in Ireland. This estimate supports the fact that Ireland is as geographically well-placed as Germany regarding the employment of solar energy. However, it is also generally recognised that solar energy brings with it certain complications which frequently apply to other renewable energy sources. Developing efficient storage systems has been highlighted as a major challenge that must be met to move this emerging technology forward. Indeed, the possibility of developing such a system has been greatly enhanced by the global decline in energy storage price. Whilst the Irish Government acknowledges solar sector analysis which demonstrates that solar PV technology costs fell by 80 per cent from 2008 to 2013, former Minister for Communications, Climate Action and Environment, Denis Naughten, argued for more time to confirm whether this decrease is indicative of a more complex underlying trend. Rather than incentivise the market by introducing a tariff that encourages exports into the national grid, the Irish Government has instead sought to imbed self-consumption as a central concept of its grant scheme. December 2017 saw the Department for Communications, Climate Action and Environment announce Cabinet approval for the introduction of a Support Scheme for Renewable Heat. The Renewable Heat Incentive (RHI) saw an allocation of €7 million from Budget 2018 to fund the initial stages of the scheme. The first applications opened in the summer of 2018, despite calls from the Irish Farmer’s Association to fast track its introduction so to allow for its implementation in the first quarter of 2018. RHI is presently exchequer-funded, and solar-thermal technology is eligible for support under the scheme. Budget 2019 has proposed further measures to support renewable projects, including a €500 million Climate Action Fund and a €500 million Disruptive Technologies Fund. Solar PV takes its place as one of the most versatile technologies to have emerged in recent times. Indeed, its versatility has been recognised as a key driver for more widespread application of the technology in the future. Solar PV’s position as a renewable technology that can be integrated into the built environment make it an ideal contender for urban-based energy projects. Conversely, the non-intrusive nature of the technology also presents itself as suitable for deployment in large projects in rural areas. The versatility of solar PV has led to a belief held by organisations such as the ISEA that it can act as an interim mitigation measure while the Government determines how to diversify its energy portfolio, whilst also serving as a long-term method of broadening Ireland’s energy mix.